Each summer, the Villanova Coaching staff welcomes the opportunity to develop future champions. The Wildcat Swim Camp staff is committed to not only building great young athletes, but also building confident young swimmers who will consistently strive to reach his or her maximum potential. Hard work is only part of the process. To achieve great success, the athlete must focus on all aspects of personal development. The Wildcat Swim Camp will provide you with that necessary direction. Villanova Head Coach Rick Simpson with Villanova Distance Swimmer Roxanne Tammadge at the World University Games in Kazan, Russia in July 2013. 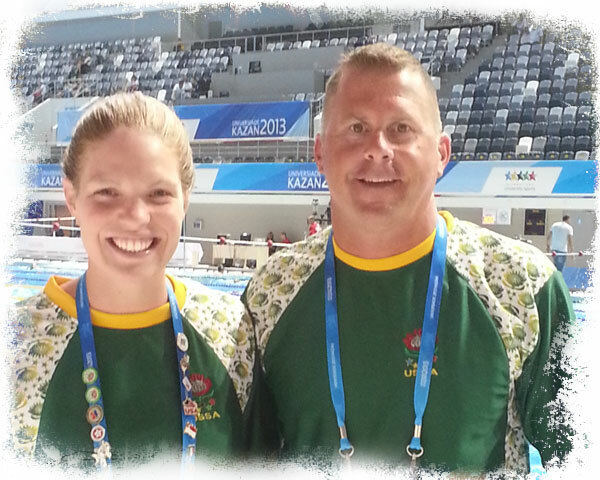 Coach Simpson served as the Assistant Coach for Team South Africa at the games.